At TallBoy interiors we do all our own upholstery and home furnishings and sometimes from previous jobs we are left with parts of material. 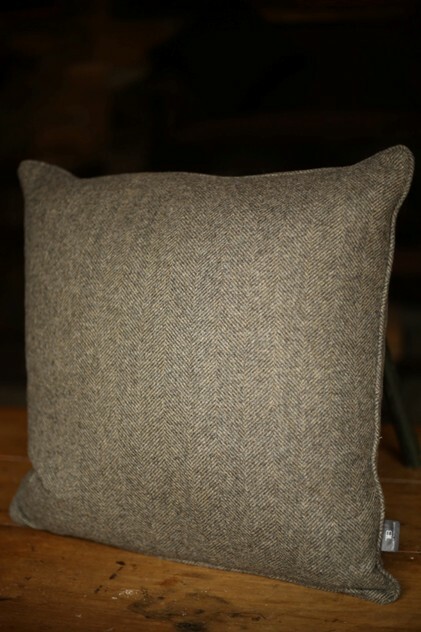 This example is in the very popular Harris Tweed. Lovely neutral colour with attractive stitching. 24inch cushions give you a great size for decoration purposes but are also ideal for support. The edges have been piped and the inside is feather down. 1 available. But more can be ordered. Price may vary on choice of fabric as this was a left over piece. Get in touch for details. ALL PRICES INCLUDE UK MAINLAND DELIVERY. PLEASE GET IN TOUCH FOR INTERNATIONAL SHIPPING ENQUIRIES.